Written for 9-12-year-old readers, Chloe Diggins and The Eternal Emperor is a middle grade adventure book featuring a tween heroine as she makes an unexpected discovery on an archaeological excavation. The novel blends the fictional discoveries at a dig site in Peru with a fast-paced chase in and around historical sites in the ancient capital of the Inca empire. Chloe Diggins is a much needed role model that girls will cheer on, boys will respect, and parents will admire. Young readers will find a heroine that is smart, warm, a little daring, and not afraid to get some dirt under her nails! 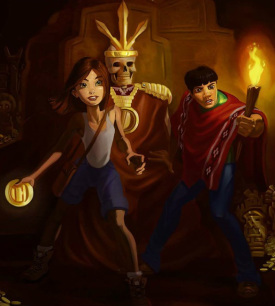 Twelve-year-old daughter of a famous archaeologist, Chloe has her summer vacation turned upside down when she discovers an ancient Inca artifact, races to find a lost treasure, and struggles to save her family. Along the way the self-doubting girl must learn to trust her heart, follow her instincts, and believe in herself again.